Every hunter (including out-of-state hunters) born on or after Sept. 2, 1971, must successfully complete a Hunter Education Training Course. Proof of certification or deferral is required to be on your person while hunting. Minimum age of certification is 9 years and cost is $15. age 9 through 16, you must successfully complete a hunter education course or be accompanied. age 17 and over, you must successfully complete a hunter education course; or purchase a "Hunter Education Deferra" and be accompanied. Texas now offers an online-only option for those students who are 17 years and older. If you are 17 years of age and older, you can now take this option which became available on September 19, 2013. You can complete all the required hunter education training online and then print your Texas Temporary Student Card after successful completion and payment for the course. No Field Day required. Allows a person 17 years of age or older who has not completed a hunter education program to defer completion for up to one year. A deferral may only be obtained once and is only valid until the end of the current license year. A person who has been convicted or has received deferred adjudication for violation of the mandatory hunter education requirement is prohibited from applying for a deferral. Take the course by August 31 of the current license year and receive a $5 discount. *Accompanied means: By a person (resident or non-resident) who is at least 17, who is licensed to hunt in Texas, who has passed hunter education or is exempt (born before Sept. 2, 1971), and you must be within normal voice control. Note: Certification is not required to purchase a hunting license. Bowhunter Education: Certification is required on certain areas of Texas (Hagerman National Wildlife Refuge, Pottsboro; and Camp Bullis, San Antonio). 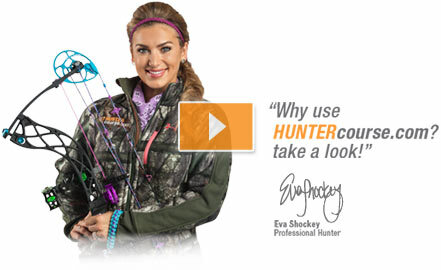 Note: Bowhunter education does not substitute for Hunter Education certification. A Texas Hunting License is required for anyone who hunts game within the state. Licenses can be obtained online through the TPWD website, or through a number of vendors throughout the state. Fees for the Texas Hunting License vary depending on residency, age and the type of hunting activity. Lifetime licenses are also available for Texas residents. For more information, please consult the TPWD at www.tpwd.state.tx. You can find out more information about game tags, permits, or draws through Parks & Wildlife. All persons on public hunting lands (state, national forests, and grasslands) during daylight hours when hunting with firearms is permitted must wear at least 400 square inches of hunter orange material with orange headgear, and at least 144 square inches appearing on both chest and back. Exempt from these requirements are persons hunting turkey, migratory birds, alligators, or desert bighorn sheep; persons within the enclosed passenger compartment of a motor vehicle; or persons within a designated campground, designated vehicle parking area, designated boat launching facility, or departmental check station. For a more complete listing of Texas hunting license laws, hunting regulations, or hunter education requirements, please consult the Texas Hunting Regulations, available directly from the Parks & Wildlife Department or on their website at www.tpwd.state.tx.us.